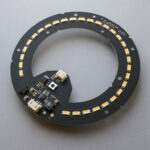 The circular design of the Ella light engine is perfect for interior and exterior light fittings. It contains 30 high powered LED’s and is used where light levels are required to be at their highest while providing unparalleled cost savings. The combination of shape and performance makes this fantastic light engine the ideal choice for creative designers.